Wash Me Now – Car Detailing Brampton. Brampton is home to more than half a million residents. As a result, this southern city, located in The Greater Toronto Area, is ranked the 9th most populous in the country. In such densely populated areas, it’s understandable that there are also many drivers and vehicles using the roads on a daily basis. As any vehicle owner knows, each time you take your car out on the road, it will come into contact with all sorts of impurities and dirt. While some might seem harmless at first, these particles can damage and scratch your paintwork over time. 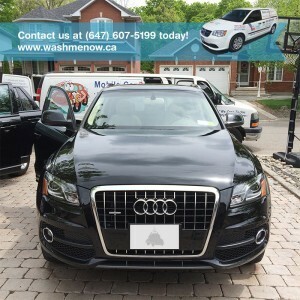 With Wash Me Now, you can enjoy the benefits of a perfectly clean vehicle – inside and out – with our professional mobile car detailing in Brampton. With the experience of working on various family and luxury vehicles, our experts at Wash Me Now know just how to get your car looking its best. From SUVs and family cars to luxury vehicles, and everything in between, we understand the individual needs of each vehicle. We see each vehicle as an important and valuable asset, and we take great pride in performing the very best car detailing in Brampton. Auto detailing is so much more than a simple wash and vacuum. At Wash Me Now, we pay attention to the smallest of details in order to provide every client with the very best results. No matter how perfect the wash, it’s those small details like dust hiding inside vents, dull plastic trim, and dirty door jams that can ruin it all. Let our team take care of your Brampton auto detailing needs for a finish you can be proud of! With over 100 5-star reviews, it’s easy to see why Wash Me Now clients return time and time again. Don’t just take our word for it – take a look online for yourself and find out why our customers prefer our services over any other! It’s no secret that washing and cleaning your car takes time. Doing it yourself will mean that you will need to sacrifice a significant amount of time. Similarly, driving to a car wash will also prove inconvenient and time-consuming. Our mobile car detailing in Brampton means that you need not take time out of your busy schedule. We will come to you anywhere in Brampton, and we bring everything, including water. Simply provide us with your address when you make your booking! Steam is an effective cleaning method for a number of reasons. Not only does steam kill germs, but it also helps clean various surfaces without any harsh scrubbing or rubbing. By using steam, we also use as little water as possible, and you enjoy all the amazing benefits!. We understand that each vehicle owner has different needs as well as different budget concerns. This is precisely why we have come up with a variety of Brampton auto detailing options. Each package offers vehicle owner the option of several treatments as well as a number of specialized extras. This means that you are in control of exactly what you pay for instead of paying for more than you need. Our packages are designed to cater for a variety of needs. While some basic packages include a thorough exterior clean, others are specific for the interior of your vehicle. There are also more extensive packages that include both the interior, exterior, and various extras. Optional extras can also be requested according to your specific needs. For example, if you need to get rid of pet hair, this treatment can be added on. With Wash Me Now, your needs and complete satisfaction is our number one priority! While other car cleaning methods use large amounts of water, our steam cleaning method reduces water usage while achieving the very best cleaning results. Not only do we reduce water wastage, but we also make use of safe cleaning products. With every vehicle we detail, we never forget our impact on our environment, and we take all the necessary steps to keep Brampton, the GTA, and Canada beautiful.